Many marketers and business leaders think they know what their audiences want. But without the data to prove your theory, you’ll never know for sure. Data-driven decisions take the guesswork out of your choices and improve your organizational metrics. Below, we look at the importance of testing your hypotheses and how a data-driven culture can positively impact your bottom line. It’s easy to make assumptions about what drives user behavior. Whether you rely solely on general industry benchmarks in a vacuum, or lean on processes that made sense in the past, a lack of ongoing data-based decisions can damage your results and cause you to misjudge your audience altogether. At Classy, we recently experienced an eye-opening moment around user behavior with our weekly blog newsletter, the Classy Roundup. 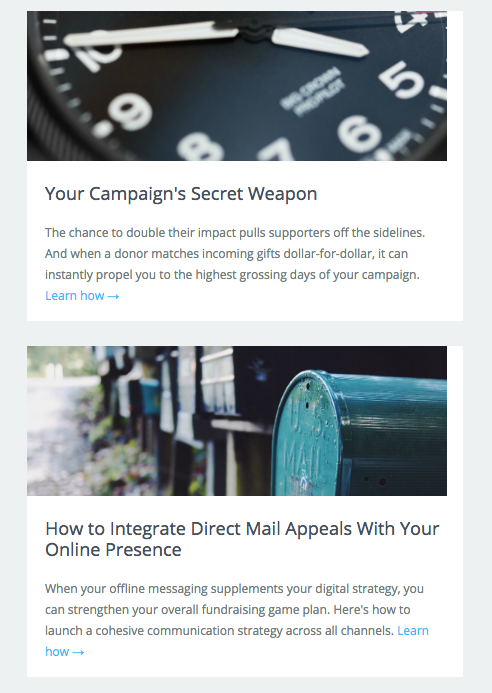 At one point, we considered whether adding images to each item in the newsletter would improve click-through rates. Up to that point, none of the sections in the email included images. Given what we knew about the power of visual content in engaging and attracting readers, we quickly assumed adding images would improve our numbers. We ran these tests simultaneously, splitting the traffic so that subscribers all saw either variation A or B at the same time. After we ran the tests for several weeks, we were shocked to find that variation A—the newsletter layout without multiple images—outperformed variation B. Our initial assumptions were proven wrong. If we hadn’t stopped to test our own opinions, we would’ve implemented a change that hurt our results rather than helped them. The same can be said about procedures and decisions that are based on habits and tradition, rather than data. When you continue a process just because it has been “the way we do things around here,” you risk losing touch with your supporters and preventing growth. For example, if your organization has historically focused on direct mailings, advertisements, and cold calling, it’s worth considering that inbound strategies (using valuable content to attract users) drive 54 percent more leads than traditional outbound marketing. Or maybe you post Facebook updates at 11 a.m. and 5 p.m. on weekdays because that’s what proved optimal in the past. However, recent data shows that you could miss major audiences that check Facebook mainly at noon or midday. Beyond testing singular questions or hypotheses—like whether adding visual imagery will improve an email’s click-through rate, or changing calls to action on your blog posts—consistent testing can have a tremendous impact on your organization. The results of testing different variables in isolation will help you to determine which changes impact your supporters’ behavior. Armed with this information, you can then craft marketing materials and campaigns that drive better holistic results than your previous ones. 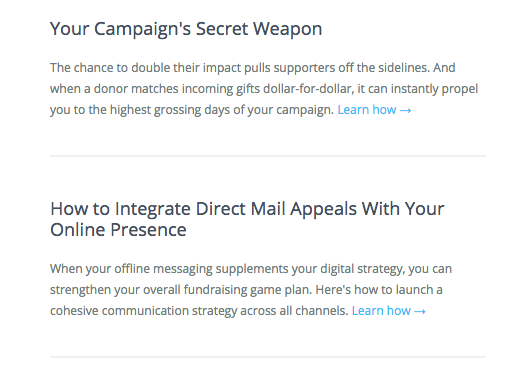 These experiments can show which changes convert interested prospects into donors. With the results of each separate experiment on these different variables, you can optimize the entire experience to drive higher conversion rates and improve your bottom line. Get your team members together and encourage everyone to ideate on how your organization can improve processes or the overall business, no matter how unconventional the idea may seem. This helps you take a hard look at your traditional way of doing things and question what you could do better or differently. How many times will you be running the test? What cadence—like weekly or monthly—will you be testing? How will you circulate the findings to your team? What strategies will you use to make sure the takeaways are applied to your organization? As you continue to brainstorm and make decisions, reassess your team’s choices and ask why that route was chosen. This applies to both habits as well as suggestions and assumptions while looking at data. An assumption based off immediate data might be that visual content has been shown to increase retweets on Twitter, but that doesn’t necessarily mean you should include images in all your tweets. In fact, with some testing you might find that images could increase retweets but actually decrease clicks on links. It’s a matter of asking why and ensuring your decision aligns with your actual business goals. The importance of testing cannot be understated. When you take the steps to “know” rather than “assume,” you pinpoint the strategies that will impact user behavior and power your growth. Have any other thoughts or tips on how to support data-driven decisions at your organization? Let us know in the comments below. This post was originally published in July 2016 and has been recently updated.